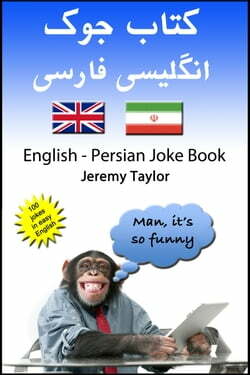 The English Persian Joke Book is an excellent way for Persian speakers to practise their English - and for foreigners who are trying to learn Persian.I first learnt German by telling jokes to people in my awful German. But I quickly progressed and now I&apos;m pretty fluent - and know lots of great... read more jokes as well. When you&apos;re trying to improve your skills in a foreign language, reading is one of the best ways - and reading jokes is probably the best of all. The best way to use this book is to treat it like a swimming pool on a warm day. Dip in now and again and it&apos;s a very pleasant experience. If you stay in too long you won&apos;t enjoy it as much.10 ways that you can benefit from downloading The English Persian Joke Book.It improves your reading skills.It improves your spelling - and your writing.It will give you some interesting new vocabulary.Jokes are short - and you will be rewarded with a laugh (or a groan).Jokes are memorable - so you can tell your friends the jokes later.If you&apos;re a teacher, you can entertain your students.If you&apos;re a student, you can entertain your teachers.It&apos;s available in a wide variety of formatsIt&apos;s available from a wide variety of suppliers so you can choose.It is a GREAT way to improve your English - or Persian.